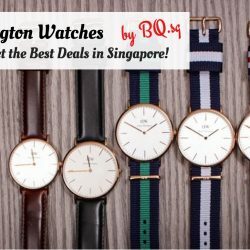 Daniel Wellington Watches: Where to Buy and Get the Best Deals in Singapore! Daniel Wellington is a watch brand from Sweden, known for their colour nylon straps, thin light cases and overall minimalist design. The clean design gives off a preppy and classic vibe, and matches with any outfit. A DW watch has become the must-have for the trendy. 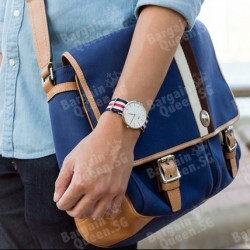 Daniel Wellington has quickly become a popular watch brand in Singapore in the recent years with a massive following on their Facebook and Twitter. You can find them in many major international shopping sites, becoming a necessary accessory if you want to be more stylish. We often receive enquiries from our readers on where to buy DW watches in Singapore and where to get the best deals. So to answer them in detail, BQ has compiled a list for you today, from the boutiques to online stores! 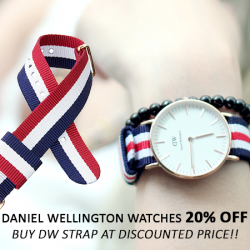 Save 20% on Daniel Wellington watches. Only from 24rd - 30th June. When you purchase a DW watch during this period, you may get a DW Nato strap at $20 and Leather strap at $40! Get a stylish and elegant Daniel Wellington watch now at Black Friday Sale with 25% off all watches and straps till Sunday, 29 November 2015! Free shipping to Singapore with no min. spend. 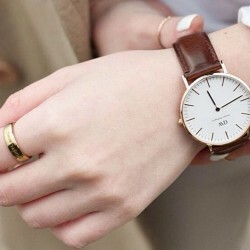 Daniel Wellington Official Website offers 10% off storewide coupon code for use till the end of July. Use coupon at checkout. Free shipping to Singapore. Daniel Wellington Official Website offers 20% Off Sale + Extra 15% Off. Use coupon at checkout. Free shipping to Singapore. Daniel Wellington Official Website offers 15% Off Sale. Use coupon at checkout. Free shipping to Singapore. With Daniel Wellington's Valentine’s Day offer you get 20% off your second watch when purchasing two watches from any of DW collections. Daniel Wellington will of course add our beautiful gift box for your discounted watch free of charge. Free shipping to Singapore is provided. The offer will be available between February 1 and February 16, 10:00 AM CET. Daniel Wellington USA official website is offering 15% OFF Storewide + Free Shipping Worldwide. Enter the coupon code shown below to enjoy the offer. 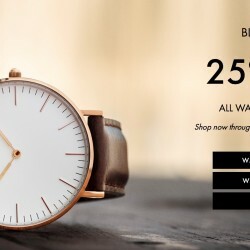 Daniel Wellington USA official website is offering 25% OFF Storewide + Free Shipping Worldwide. Enter the coupon code shown below to enjoy the offer. The deal is valid on 11 Nov 2014.